New York City has been at the forefront of public health for more than 300 years. The city's Department of Health and Mental Hygiene (DOHMH) has long been considered a leader in its efforts to control infectious diseases and promote healthier lifestyles. The terrorist attacks of September 11, 2001, and the emergence of diseases such as West Nile virus (WNV), anthrax, and severe acute respiratory syndrome (SARS) have prompted the city to address its level of preparedness and ability to respond to these incidents. During the past few years, the city has been working to improve its monitoring and response capabilities. DOHMH monitors infectious disease trends and disease outbreaks, whether they occur naturally or are man-made, by utilizing a number of different surveillance systems that incorporate GIS technology. As this technology has evolved, the city has developed a broader use for its functionality. 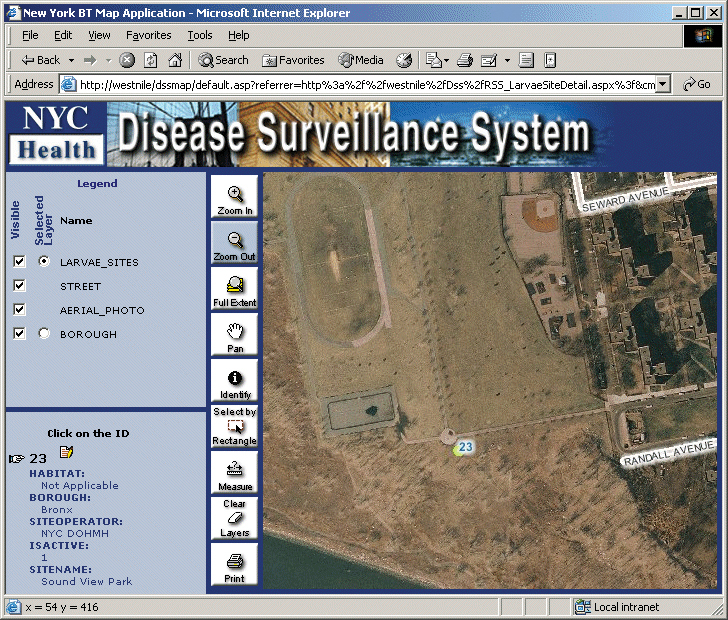 After West Nile virus first appeared in the United States in the summer of 1999, DOHMH awarded Esri Professional Services a contract to develop and design a vector and avian (mosquito and bird) tracking system using a GIS-enabled database and Intranet application for department staff use. The database is implemented with both spatial (ArcSDE) and relational (SQL Server) database management system software that allows staff to collect incoming information from the public through an ArcIMS software-enabled Web site. New York City's disease surveillance system: The point locator site in the monitoring system is used to update specific pint information. This system has helped DOHMH monitor the virus through the intake of standing water complaints and dead bird reports from the public and allowed department staff to manage data received from laboratory testing of mosquitoes and blood and tissue samples from dead birds and other animals that were infected with the virus. The data has allowed DOHMH to make sound decisions about where and when to spray pesticides, identify problem areas in advance, and target areas that cause further infestation. Monica Marquez, project manager for the Vector and Animal-Borne Surveillance System, explains, "The department devoted a tremendous effort to designing and developing a GIS-based system that has allowed department staff to collect, manage, and analyze data so that appropriate decisions could be made regarding disease control methods." The department's ability to tie collected information to a specific location in the city was one of the keys to understanding the nature and magnitude of the disease. However, DOHMH has continued to improve and expand this system, considering it essential to the department's success in fighting West Nile virus and other infectious diseases. "The experience gained by the department through this development process has been extremely valuable," says Marquez. "We continue to fine-tune our data system to enhance how it supports the department's response to infectious disease and helps us better protect the community. Since the initial development of the West Nile virus system, enhancements have included front-end map reports that indicate where positive mosquito pools are located and functionality for users to assign a larvaciding work order from a point on a map. This enhancement effort also supports our vision of making the system generic enough to support future outbreaks, regardless of disease." 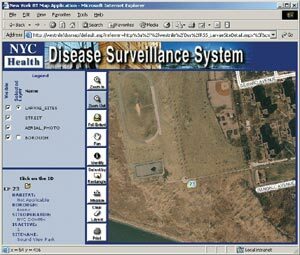 In 2001 when the federal government increased funding for local homeland defense programs, the city leveraged the functionality of its West Nile virus tracking system and began a process of evolving and extending it enterprisewide to monitor unusual diseases or disease trends found in animals or insects that may indicate bioterrorism. In the fall of 2002, DOHMH tasked Esri Professional Services with further development of components for the city's envisioned bioterrorism response system. The goal of this larger response system is to use GIS technology to spatially relate events recorded around the city to help city staff respond to threats of bioterrorism and closely monitor outbreaks of infectious disease citywide. The city's Bioterrorism Response Geographic Information System (BTRGIS) represents a move toward a more robust system in which a number of software modules will complement and share data with each other using GIS technology as its foundation. "When the department began this project," explains Marquez, "we used a custom-built MapObjects geocoder to integrate with the West Nile virus tracking system." As technology has evolved, DOHMH found that it could migrate this geocoding application to a centralized geocoding module using an XML interface that points to a geocoding engine developed by the city's Department of Planning. The geocoding engine automatically geocodes the addresses of incidents, specimens, and other entities against New York City's basemap street database and returns coordinates and additional address information to the user. "The Department of Planning's geocoding engine is fully tailored to New York City's addresses," says David Burgoon, GIS technical lead for DOHMH on this project. "The development of this geocoding module now makes it available as a reusable component to all existing and future applications in any of the city's departments." In addition to interacting with the city's geocoding engine, the geocoding module provides an ArcIMS software-based map interface that allows for visual inspection of the geocoding result and correction of the geocoding result when necessary. "In other words," adds Burgoon, "we have moved from a monolithic approach to a distributed service-oriented architecture allowing us to design a system to meet multiple agency needs." By integrating GIS and the city's standardized location data with specific agencywide databases, DOHMH is able to analyze collected health data and evaluate how disease trends and environmental conditions have or will affect public health. DOHMH is using BTRGIS to geocode the addresses of incidents, specimens, and other entities against the city's basemap street database, allowing users to geocode addresses to specific common places and accounting for address-specific abnormalities in the city that are adjusted in the Department of Planning's basemap. "The ability to create a core geocoding service for the agency has given programs the power to spatially relate seemingly independent events," says Beth Maldin, who manages the development of a number of the agency's bioterrorism technology projects. "This has proven to be key for the agency's West Nile virus surveillance program successes and will be an essential tool in other areas of bioterrorism and disease surveillance." For more information, contact Monica Marquez, M.P.H., New York City DOHMH project manager (e-mail: mmarquez@health.nyc.gov, tel. : 212-442-5292), or Marten Hogeweg, Esri project manager (e-mail: mhogeweg@esri.com; tel. : 909-793-2853, ext. 1-1129).